Cell encapsulation and cell delivery have been proposed as an alternative approach to treat various diseases since they allow localized and controlled delivery of therapeutic cells to specific physiological sites to restore the lost functions, which can overcome many current limitations in the present therapeutic technologies. In particular, great interests have been attracted in utilizing stem cell as the cell source for cell encapsulation and therapy in the recent years. 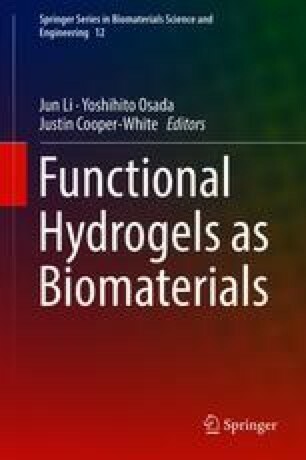 This chapter provides an overview of cell encapsulation technology based on hydrogel biomaterials, with a focus on stem cell encapsulation and some recent developments of such strategy for its use in treatment of diabetes. It is well established that stem cell encapsulation can be a promising approach for therapy of diabetes, especially in cases where limited cells are available for differentiation and expansion. Several potential stem cell candidates and their differentiation protocols have been examined and developed. The authors believe that stem cell encapsulation may see exciting improvement in the next few decades. However, a few challenges have to be addressed such as safety and efficacy of this approach for treatment of diabetes and scale-up of manufacturing process under Good Manufacturing Practice conditions before the technology can enter human clinical trials and become a real clinical therapeutic strategy.